“These dogs have been so sweet,” said Dr. Richards. “I’m actually really surprised. A lot of them, we know haven’t had a lot of contact with people, and they’ve been so good. 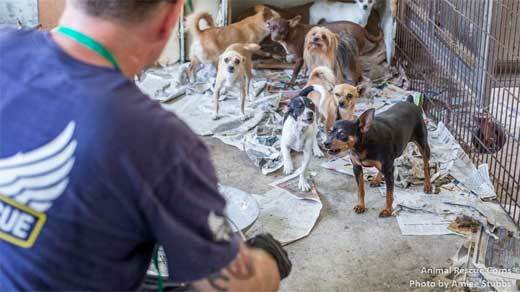 Following a large scale liberation at a puppy mill in Page County, Virginia, there were many dogs whose future was quite uncertain. 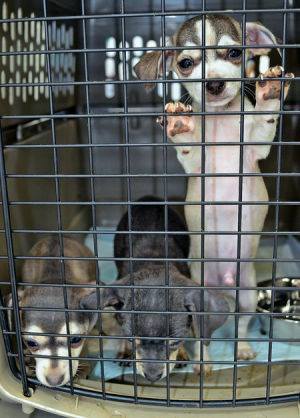 How to feed and care for the many dogs brought out of that situation was a question the Page County Shelter was unsure of how to answer. Now, thanks to the Caring Hands Animal Support and Education (CHASE), that question has been answered. Chase said in a press release that they will be treating and caring for at least 100 of the 132 dogs liberated from the puppy mill bust. There were also parrots taken off the property during the bust as well. Amongst the dogs, untreated eye infections, respiratory conditions, severe matting, and many dental issues are at the forefront of what CHASE will be handling. 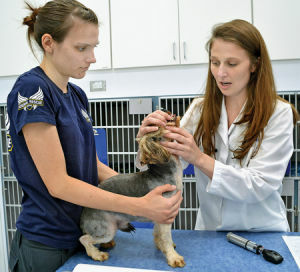 Caring Hands vet Dr. Carole Richards said she’s amazed by the good nature, and great disposition of almost every dog she’s come across so far, given the desperate conditions they were born and raised in. Once a full spectrum of medical treatments, and temperament evaluations are completed, these dogs will then be fostered with volunteer families all over the county. Then, they will become available for adoption.